Galen Fick and his wife Sandy, shown with one of their Brown Swiss cows at the Iowa State Fair, have a 50 cow herd in Boyden, Iowa. As a cow is prepared for milking, the first spray of milk is squirted onto the floor before the teat is connected to the milking machine. Doug Lyons, a dairy farmer from Castalia, Iowa, encourages one of his cows to her feet so they can enter the show barn at the Iowa State Fair in Des Moines. Galen Fick milks 50 Brown Swiss cows every day on his farm in Boyden, Iowa, where his family has been in the dairy business for generations. Life as a dairy farmer has gotten harder and harder, he says, especially in the past two years. 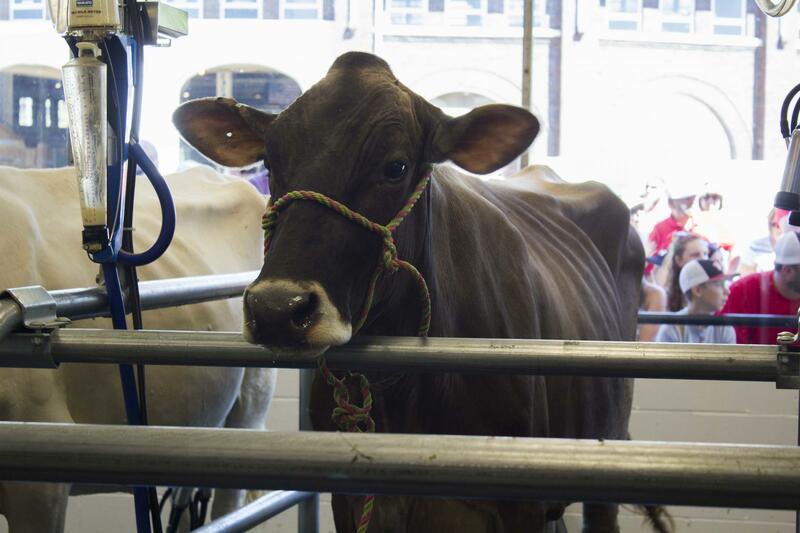 A cow is milked at the Iowa State Fair, where people can watch the process through a large window. Dairy farmers like Fick want some reassurance that the market for milk will pay them enough to stay in business. Meanwhile, when you head to the supermarket, you want the milk on the shelves to be abundant and affordable. The federal government for decades has stepped into that equation to keep things stable in the dairy industry. But Fick and other dairy farmers say the government’s current safety net program does not work. Fick is enrolled in the Margin Protection Program, a form of government-subsidized insurance that came online with the 2014 Farm Bill, the massive law that governs everything from food stamp benefits to farm supports, including the dairy program. Farmers pay a flat fee to join the Margin Protection Program and receive a payout if their margin — the difference between the cost of feeding cows and the price farmers get for milk — is too tight. They can pay extra for more coverage. Even the Department of Agriculture, which administers the program, says it is not working as intended. It is letting producers opt out early if they want. But Fick does believe some kind of federal help is necessary. Twenty years ago, the U.S. had almost three times as many dairy farms as the 41,000 it has today. Why do we have too much milk with fewer dairies? Modern technology makes farms more efficient, but to make money, they must achieve economies of scale. And that often means growing much bigger. Some have thousands of cows. In March, the country had 9.4 million dairy cows, the highest number in 20 years. More cows mean more milk. Global markets buy up some of our dairy products, but then farmers anticipate a strong export opportunity, gear up to sell internationally, and watch as trade winds blow a different direction. China and Russia had been big milk importers, but their demand has slowed. U.S. farmers are left producing excess milk, and while much of it is processed into cheese, yogurt, ice cream and milk powders, which have a longer shelf-life than fresh milk, the oversupply drags the farmers' payout down even more. “You can't have a program that's too generous because it will generate too much milk production and ultimately be self-defeating,” National Milk Producers Federation vice president Chris Galen says. But he says farmers do need to see tangible benefits. Now is the time for change, Galen adds, as Congress tackles the next Farm Bill. Some senators have suggested the traditionally bipartisan bill could get through Congress yet this year, well ahead of the current one's fall 2018 expiration date. Galen’s group, other dairy industry advocates and some farm-sector powerhouses such as the American Farm Bureau Federation will be pushing for reforming rather than replacing the program. For example, Galen says the formula the government uses to calculate margin is flawed. “The overall margin that's being measured every month at the national level doesn't really reflect what the true economics are on dairy farms,” he says. Galen says better math would calculate prices and costs more accurately. He says the government uses average prices for corn, soybean meal and alfalfa, which are the primary feed ingredients, that underestimate what farmers are actually paying. In addition, he says premiums farmers pay for coverage above the baseline need to be calculated every month rather than every two months to be more useful to farmers. In the past, the Department of Agriculture attempted to shore up falling prices by purchasing dairy products in times of surplus. But Galen says that program became very expensive for the government and did not provide an adequate safety net to dairy farmers. Still, even an improved program likely won’t please everyone. Matt Schelling, another northwest Iowa dairy farmer with 150 cows near Orange City, says dairy programs generally have helped small farmers like him. Maybe it is time to see whether the industry can stand on its own, he says. Dairies might be okay without subsidies, though that’s very much an open question, but there is no doubt about something else: they need workers. Many dairies depend on immigrant labor to do the daily, year-round, physical, smelly work. “It’s been at a crisis level for the last couple of years and it’s getting quickly more critical as workers leave the country and whatnot,” Schelling says. As Congress drafts the next Farm Bill, farmers will be watching to see whether anything from Washington makes a difference in the dairy barn. Midwest Dairy Cows Are Milk-Producing Machines, But Is There A Ceiling? America's dairy farms are doing more with less. There are fewer dairy cows today than just a few decades ago, but today’s cows are churning out more milk than ever. Part of the increase is due to genetics. Dairy cows have been bred to be larger, hungrier, and more productive. But that focus on genetics to produce more milk has some prominent livestock advocates ringing alarm bells. When it comes to milk production, no other cow tops Gigi. The population of Northern Colorado is booming. People are flocking to the area and population numbers are on the rise. The same thing is happening with dairy cows. Weld and Larimer counties already sport high numbers of beef and dairy cattle, buttressed by the region’s feeding operations. But an expansion of a cheese factory owned by dairy giant Leprino Foods will require even more cows to churn out the milk needed to produce bricks of mozzarella cheese and whey protein powder. A war is brewing over what you pour on your breakfast cereal. Dairy farmers say the makers of plant-based milks – like almond milk, soy milk and a long list of other varieties – are stealing away their customers and deceiving consumers. And they’d like the federal government to back them up. At its heart, the fight boils down to the definition and use of one simple word: milk.